Updated: 9/4/2011 - PaperShaper Building Compilation CD Released. All 6 buildings on the same CD. One CD - New low price!!! Stone Graphics designs boardgames and wargame playing aids. 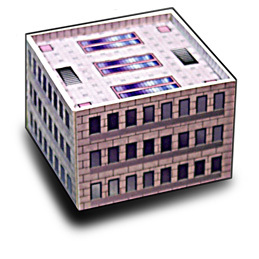 This CD contains 6 different modular buildings. There is a gothic building, an adobe building, a skull building, a hotel building, a brick apartment building and a modern glass building. Print them out yourself on a high quality ink-jet printer and make a city for your miniature games. See Limited License Agreement before purchasing. Assembly instructions here. This CD contains 15 different space map sections (8" hexes). Each map section has 5 different layouts. That is a total of 75 PDF files ready to be printed, glued to cardstock (or foam core board) and cut out. Print them out yourself on a high quality ink-jet printer and make an impressive space board for your miniature games. See Limited License Agreement before purchasing. Buildlings and models designed to be printed, glued to cardstock and assembled. Varous designs on CD saved in PDF format. Print them out yourself on a high quality ink-jet printer and build a cityscape for your favorite 6mm miniature game. The compilation CD contains all 6 popular modular 6mm scale buildings  enough for a entire cityscape of various structures. If you are interested in this product, click here to to be directed to the Product Order Page. Terrain designed to be printed, glued to cardstock (or foam core board) and assembled. Varous designs on CD saved in PDF format. Print them out yourself on a high quality ink-jet printer. 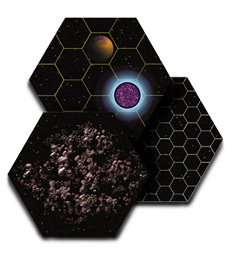 The first CD contains a slew of space hexes. There are map sections without movement hexes, map sections with 1" movement hexes and map sections with 2" movement hexes. Perfect for any space miniature game you play. If you have an interested in this product, click here to be directed to the Product Order Page. Stone Graphics, PaperShapers, and PlaeBoards are a Trademarks owned by Sayth Stone. All material on this site is ©copyright 1997-2011 by Sayth Stone. All rights reserved.